The holidays are quickly approaching! As the Jones family down the street starts hanging their cookie-cutter lights, opt for something a little different and a lot more redneck. Don’t know where to start? No worries! The folks over at Rated Red have gotcha covered. 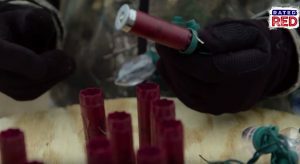 All you need to make your Christmas light display just a little more jolly is a string of lights and some shotgun shells. First, collect your shotgun shells. Next, take the regular bulbs off your string lights and replace them with your shells, it’s as simple – and fun – as that! 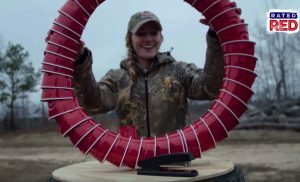 To keep the holiday parties going – collect some red solo cups from your next party and make your very own “redneck wreath.” All you need to do is staple each cup to the next almost like you’re stacking them, but with a bit of space in between. Finally, wrap it around into a circle and staple the starting cup and ending cup together. 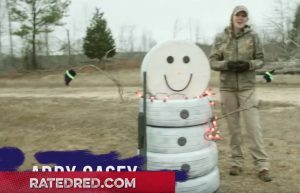 Now, if you’re going to go redneck on the lights and wreath, you might as well go full redneck with the perfect snowman. Heck, this one won’t melt so you can keep him up all year round! Just get some spray paint, a few tires, and whatever odds-on-ends you can scavenge for the rest and get to work. You can check out their full video tutorial below for extra tips and tricks to make this holiday season as country-fried as they come!